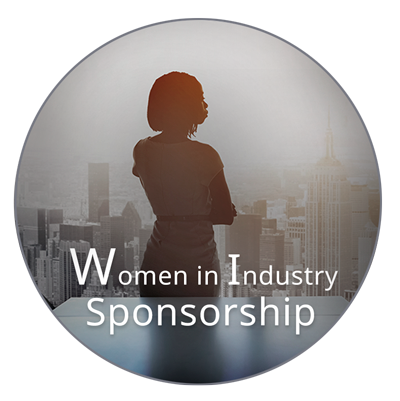 Show your support for Women in Industry, by becoming a sponsor. Your company's name will be prominently displayed during the course of the conference. Don't delay – limited sponsorships are available. Sponsorship Details: Limited sponsorship opportunities available beginning at $1,000. All sponsors will be promoted on the mobile app and on event signage. By sponsoring an education speaker, your company representative will introduce the speaker. Your company logo will also appear on the event signage and the mobile app. By sponsoring one of the off-site activities, your company will be featured on conference materials leading up to the event, your logo at the event, and onsite signage. Help attendees keep connected with what's going on at the office by sponsoring WiFi during the meeting. The log-in can even be your company name. Your company logo will appear on event signage, and mobile app. Give attendees a break they deserve by sponsoring one of three available meal opportunities. Your company will be featured on event signage, the mobile app and have custom napkins with your logo. Sponsor the Women in Industry Forum individually. Your company name will be listed on general conference signage.